You’ll have to forgive my long absence… the PH blog has been undergoing a major spruce-up! So whaddya think of the new design? Our focus in re-designing was to make this space more user-friendly, less cumbersome to my server, and (of course) more attractive to you (and me!) I’m SO pleased with the result, and excited about additional future changes to come. 1) Endless centuries of thanks are due to my friend, Rae, who has single-handedly re-vamped the blog for me over these past few months. Without her, we’d all be lost! 2) My sister-in-law, Katie, whose lovely handwriting you see on my new logo above. I LERRRRVE the new logo! I love the coziness of knowing those are my hands, holding my husband’s favorite mug, with his sister’s perfect little scrawl for my blog title. Good stuff, people, good stuff. **You’ll also notice a new little addition to my sidebar… a PayPal button! Why, you ask? Because my genius Facebook fans gave me the idea. This blog has grown so much! (A fabulous problem to have.) But that growth has placed a strain on my server and brought me to an impasse. I either needed to upgrade to a server that costs much more than this blog earns OR get shut down for overloading my server and breaking the “rules.” I posed this conundrum to my Facebook following, and while some suggested I start charging for blog content (“No way, Jose!” was my response), others suggested a “Donations” button that faithful fans/readers could use to help support the blog and keep the recipes and kitchen musings a’flowing. I liked that idea! So if you love Pretty Hungry and want to keep enjoying these posts (perhaps over a hot cup of coffee in the mornings or an evening glass of wine), readers everywhere would greatly appreciate your donation to keep the site running. Now let’s talk about summer food! 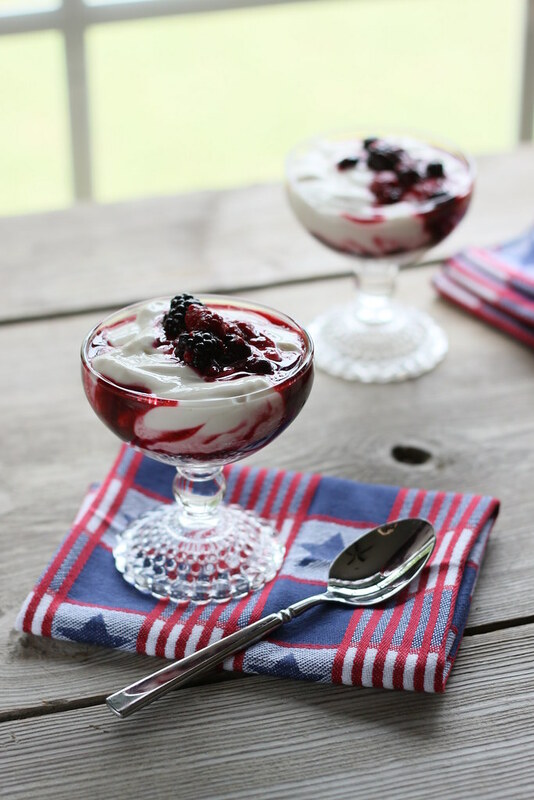 This Honey Vanilla Berry Parfait is July’s featured recipe from the Pretty Hungry 2015 Recipe Calendar! It’s simple, refreshing, super-luscious, and takes a whopping five minutes to whip up. Killer for breakfast or brunch, but also a show-stopper for dessert. (And especially figure-friendly in the realm of desserts.) So basically, an all-around home run. Bonus points if you make it fancy by eating it out of a pretty parfait dish. I’m so so sooooo delighted to be back posting regularly. This blog is one of my happy places. I hope it’s one of yours too. Be sure to make this yogurt and tag me on Instagram so I can oooh and ahhh appropriately. And Happy July!!! My birthday is in two days, so TRUST I’ll be posting my birthday menu, cuz’ seriously, YUM. You need it in your life. The perfect refreshing summer breakfast or light dessert! Place berries in a sauce pan along with honey, vanilla, and salt. Heat very gently (do not boil) until a light syrup forms (2-4 minutes.) Layer fruit sauce into glass dishes along with generous dollops of Greek Gods Honey Vanilla Greek Yogurt. Garnish with mint if desired. Serves 4.